Solar/Generators- Solar panels, generator hook ups and consultations to get the most out of your system. Troubleshooting- Switches or outlets not working? Circuits out? Breaker tripped? Don’t know what to do, call us. New Construction/Remodels- New construction and remodel estimates and proposals. Repairs/Rewires- Repairs ranging from fans, and electric gates to knob and tube upgrades, we can handle it all. 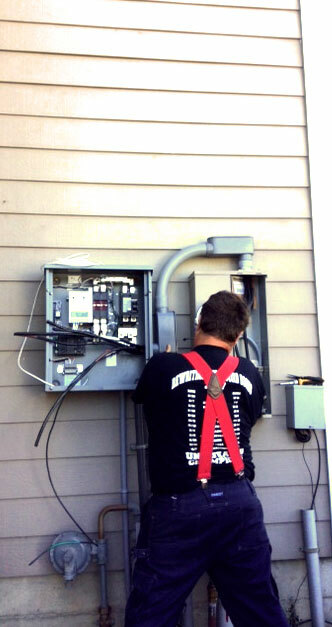 Services- Upgrade your fuses or breakers, install a new sub panel or service. Inspections- Written electrical inspection. Great for when you are thinking of selling or buying a home. Telecommunications/Data wiring- Add a phone line or jack, or new line for your computer. Lift Truck- We have the ability to reach up to 35’. Helpful for installing parking lot lights, or other hard to reach outdoor electrical projects. Plan Reviews- Let us help you review your electrical building plans. Hot tub Instillation- We help from the early stages of finding the best place to install your tub to doing the electrical installation. Parts/Equipment- Brant Electric has a warehouse of discontinued and hard to find parts and equipment. Need to find that discontinued breaker, we may be able to help.